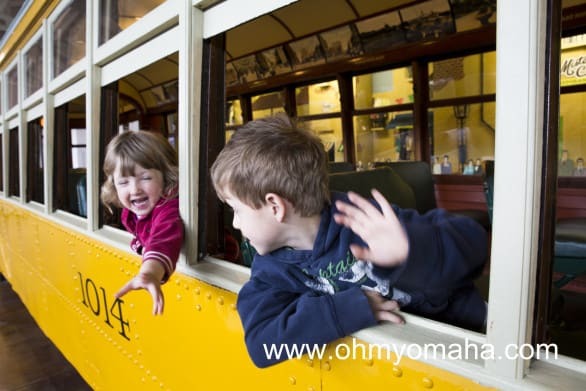 If you have a kid that has even a remote interest in trains, chances are, you’ve been to the Durham Museum in downtown Omaha. We’re going on five years of visiting the museum, and while we still hit the train stuff at the museum, the kids have progressed to exploring the rest of the museum. 1. 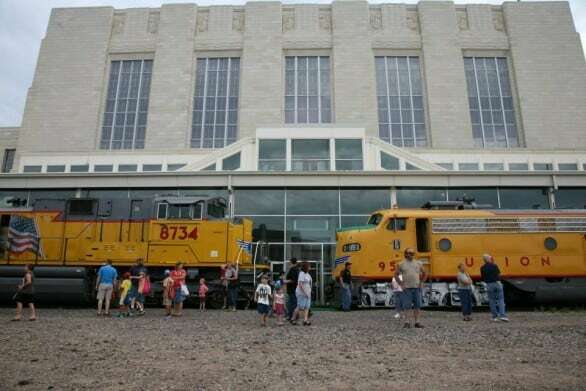 Explore the trains – The Durham Museum used to be Omaha’s Union Station, where 10,000 people passed through each day. It’s only natural that trains are a huge part of the museum. Taking a break in a real passenger train inside the Durham Museum. The Durham has a huge model train exhibit that kids can interact with, as well as real train cars families can walk through. 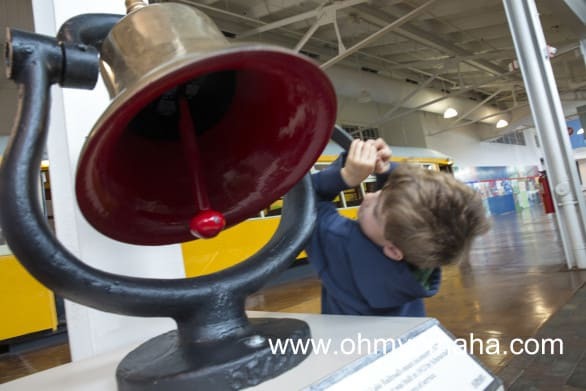 And, being the loudest thing in the museum, kids just love ringing the train bell. The loudest thing in the museum is going to attract your kids like moths to a light. Along a similar vein as the train car is the streetcar. We’ve never been to the Durham and NOT ran through the streetcar at least once. Kids love running through this model of a streetcar. 2. 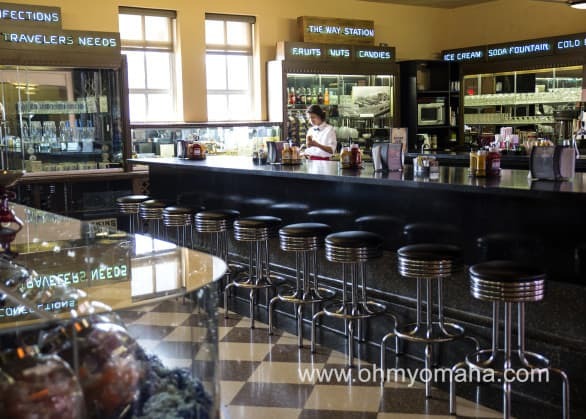 Visit the soda fountain – Here’s a trip back into time: The Durham has a functioning soda fountain, where the staff wears soda jerk uniforms and pour tasty phosphate (the original soda). The soda fountain at The Durham Museum in downtown Omaha. Kids can also order at the candy counter. 3. Check out the teepee and earth lodge – Brummer said both are popular exhibits. My kids enjoyed running in and out of them several times. 4. Pose with the statues – Come on, everybody does it. The Durham’s gorgeous main hall features several statues of people doing what you’d expect people would be doing at a train station: Checking out departure times, saying their goodbyes, waiting for a loved one. 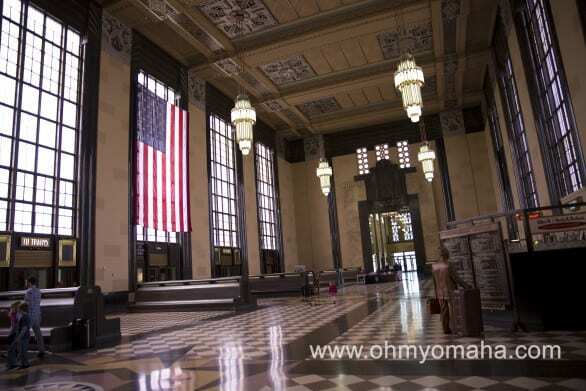 The grand hall is the first thing you see when you enter the museum. Look for statues scattered around the hall and proceed to pose like a fool with each of them. You know it’s fun. 5. Head to the “Coin Room” – Brummer has noticed kids like looking at the ancient coins in the Byron Reed Exhibit. 6. Look for Scout the Buffalo – He’s pretty easy to find, actually, but he’s cool to see up close. Since you can’t touch Scout, the museum thoughtfully put a coat on display that you can touch. 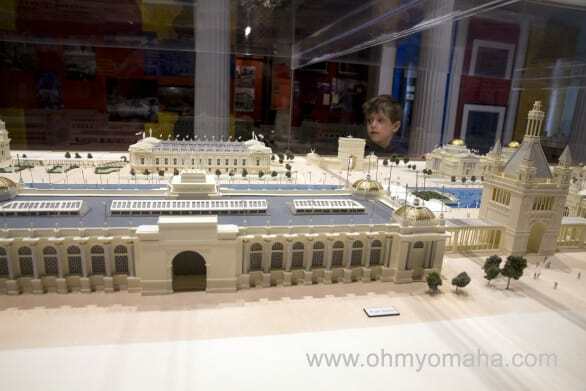 A museum docent tried explaining to Farley how buildings and bridges just like the ones in this display once were real and existed for a short time in Omaha. The Durham Museum has a room dedicated to The Trans-Mississippi & International Exposition of 1898. There are few vehicles in the museum in addition to trains. Try to find the one-room schoolhouse in the lower level of the museum. Look for this big guy in the museum. He’s not hard to find. There’s a photo archive in the basement that is open to the public. You can purchase prints there, or just take a look at really old photos of Omaha. It’s probably more interesting to adults to see what familiar haunts used to look like, though. March 17 through July 29, 2018 – “American Adventure.” Blending historical accuracy and the complexities of real life and death decisions, American Adventure delivers a truly unique and effective learning experience. Visitors choose a unique identity of one the Jamestown colonists and track a series of life choices on an easy to use abacus representing “life points” for health, wealth, food, and morale. You have to maintain all of them to “survive” the exhibit. Visitors will encounter four content-rich “Season Galleries” and engage in hands-on activities that result in choices relevant to their character. In July – Railroad Days. Durham Museum is one of five participating venues and you can get up close to train on the railroad tracks outside. In July – Wild Wild West Days. Celebrate all things Wild West, and learn to lasso, watch a shootout and other fun activities. In August – Root Beer Float Day. FREE root beer floats at the soda fountain! In October – Great Halloween Haunt. Trick or treat to historical figures, join in a dance party, and make crafts. It ties in Halloween fun with a little historical education. 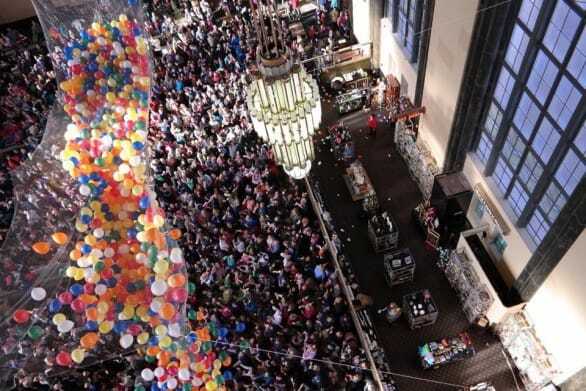 Nov. 23 through early January 2019 – Christmas at Union Station kicks off with the area’s largest indoor tree lighting celebration the day after Thanksgiving, and continues through the holiday season with family-friendly events like visits from Santa, concerts, the Ethnic Holiday Festival, the popular Noon Year’s Eve and many more. Where: 801 S. 10th St. When: Tuesday, 10 a.m. to 8 p.m.; Wednesday through Saturday 10 a.m. to 5 p.m.; Sunday, 1 to 5 p.m. Closed Mondays and major holidays. Cost: Adults, $9; Seniors (62+), $7; Children (ages 3 – 12), $6; children 2 years and under, FREE; Members, FREE. A note on memberships: If you’re going to visit the Durham Museum more than once a year, it pays to get a family membership. It’s $60 for 12 months, and includes admission to the special events like the Great Halloween Haunt and all the Christmas festivities. It also gets you discounts to the gift shop, soda fountain and summer camps. Disclaimer: The Durham Museum provided complimentary admission for my family so we could explore the museum, and I could tell you about it. They also gave us some comp passes to try some food at the soda fountain, but truth be told, we would’ve totally stopped there for to have a malt even without the passes! Look at you. You found the Oh My! Omaha fifth anniversary giveaway post! 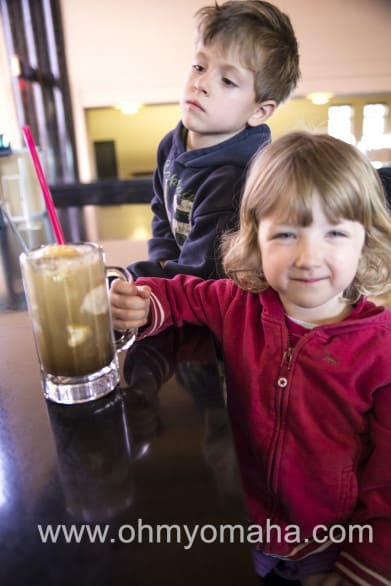 Enter to win a Family Day Pass for four to visit the museum AND four treat vouchers to redeem at the museum’s awesome soda fountain (root beer float, anyone?). Day pass must be redeemed by Aug. 1, 2018. Day pass admits two adults and all dependent children’ (or up to four grandchildren), and has no cash value. This giveaway ends March 12, 2018 at 11:59 p.m. Must be 18 or older to enter and live in the U.S.
You have such a cute family. Your pictures convinced me I need to make a trip over there. 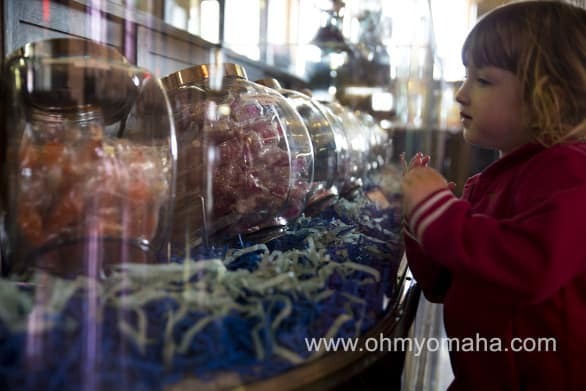 There’s so much great stuff in Omaha! Aw, thanks, Bobi! 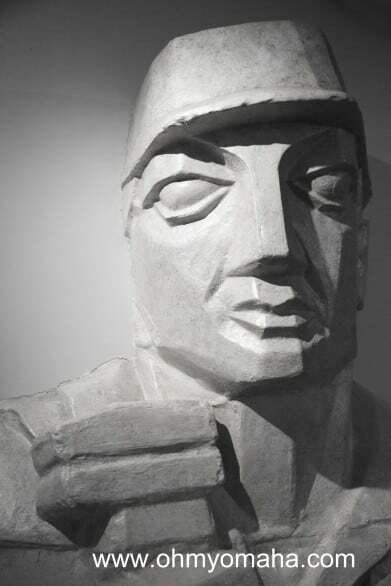 Let me know what you think of the museum after you visit! I loved when they had cultural Christmas trees from around the world. It was neat to read about each and every one of them. 5 year old liked the trains but loved taking a picture with the bison! I loved when they had period movie costumes on display, and the old west exhibit was really fun too! Oh and the Egypt exhibit! They’ve had so many great ones! My family and I love going to the Durham Museum. Our daughter’s first visit was when we took her to see Princess Diana’s wardrobe. I didn’t read through all the posts so this may be a repeat question. Is that the original wall from Mr. C’s behind the streetcar ? Yes it is. Good eye! The Durham is such a great place to visit for all ages. 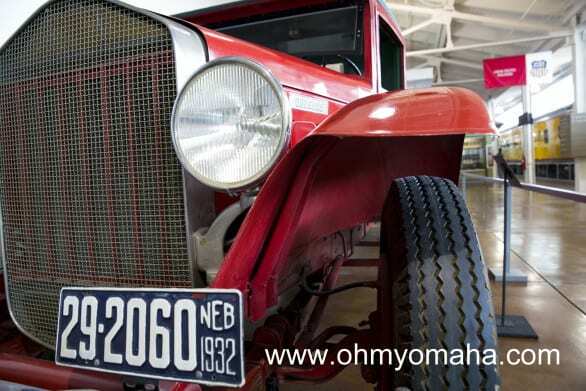 Omaha is very fortunate to have such a wonderful museum right here. We would love to visit this museum!!! So many amazing exhibits!! We enjoy Railroad Days, although it’s very busy! There was a special exhibit a number of years ago that my son and I loved. I can’t exactly remember it, but it was something about how we are made—DNA, etc, I think. Such a great museum! I can’t remember a specific past exhibit or annual event for our family; however both of my children love exploring the trains.